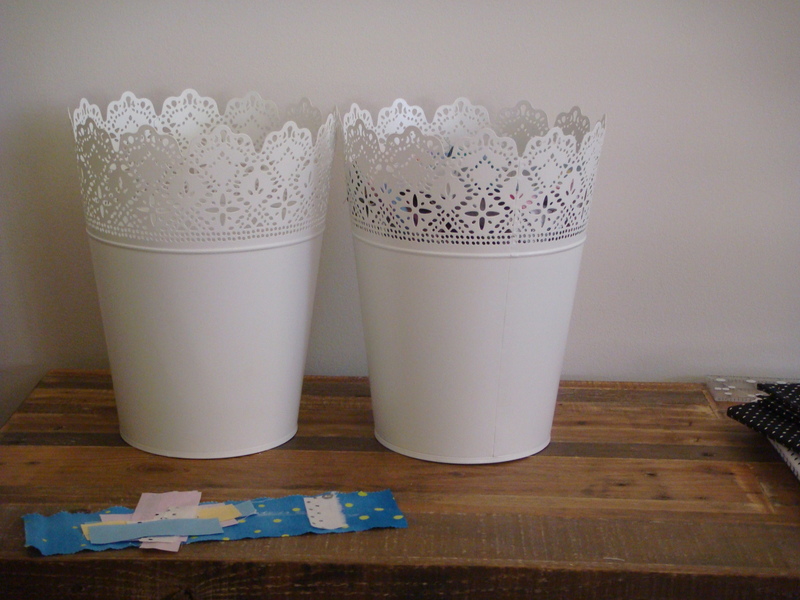 Jennifer at Ellison Lane is hosting a linky party for sewing spaces, and I thought I’d join in. 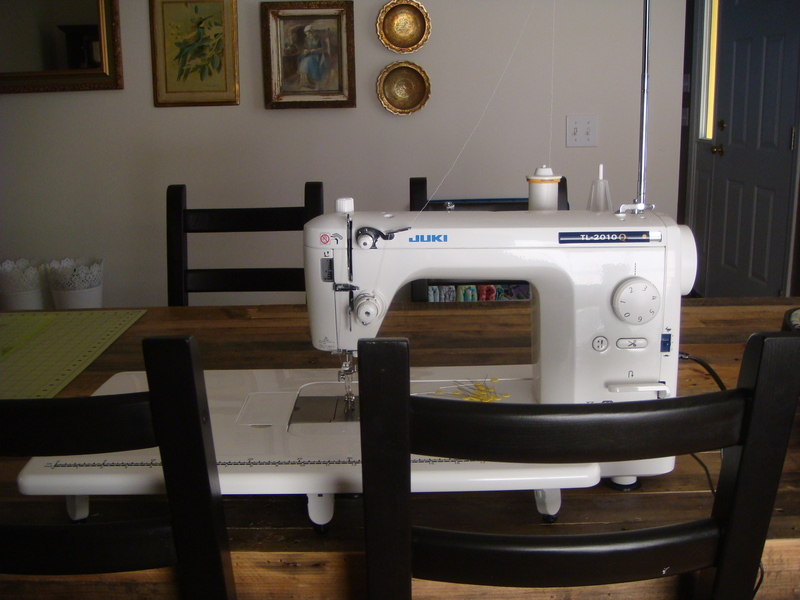 I currently sew at our dining room table, although I hope to turn the nursery into a sewing room as soon as the baby is old enough to bunk with big brother. He’s not a baby anymore really – he’s 2. But I enjoy still thinking of him as “the baby” for now. This is my beloved Juki, which I purchased earlier this summer and just adore. I made several beautiful quilts with my old Singer though and I actually had to keep her for the occasional need of her zigzag stitch. 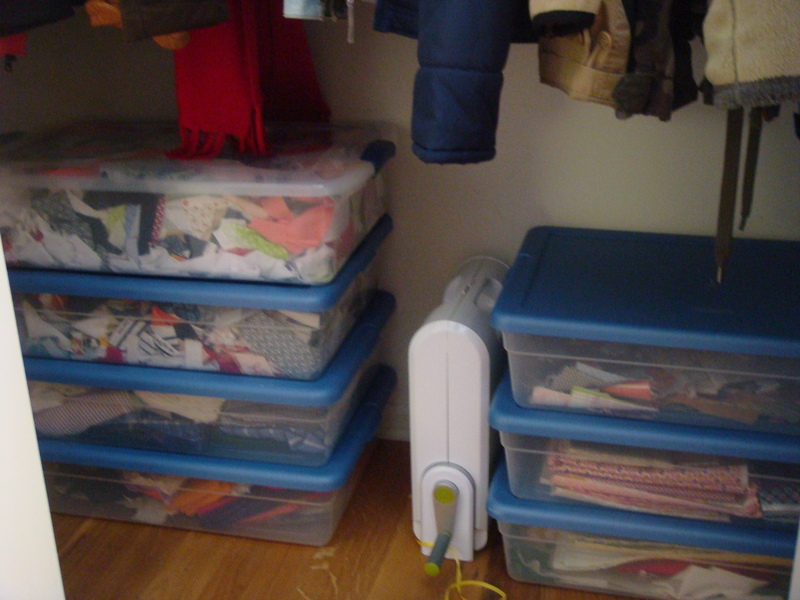 This is how I keep my sewing space as tidy as possible, given that it’s in the middle of our home: one bucket for scraps big enough to use and one bucket for scraps less than 1 square inch (my personal cutoff). And there’s a little “quilt” my 3-year-old made with scraps and glue. So cute. I keep my fabric in the closet. There’s my neglected Accuquilt cutter. I really should sell that. Have you seen Jeni Baker’s folding method? After a few of you mentioned it in your stash showing party posts I checked it out. Actually her whole “Art of Choosing” series is pretty interesting. I’ve been working my way through it. On Saturday night I started refolding my stash while watching some new Tom Cruise movie with my husband! It’s a big job but I love how it’s looking. The thing I look forward to most about creating a new sewing room is the idea of getting my fabric out of hiding and displaying it on shelves! That will make me so happy. I’ve been tempted to fill this guy with fabric but I’ve resisted so far. So that’s where I sew guys! Moving it will be bittersweet because I love being nearby the kids’ playroom. I’ll have to find a new way of organizing my sewing time. Today sewing starts for our first project for the Penny Sampler! I’m sure I’ll have some WIP pictures to share very soon. 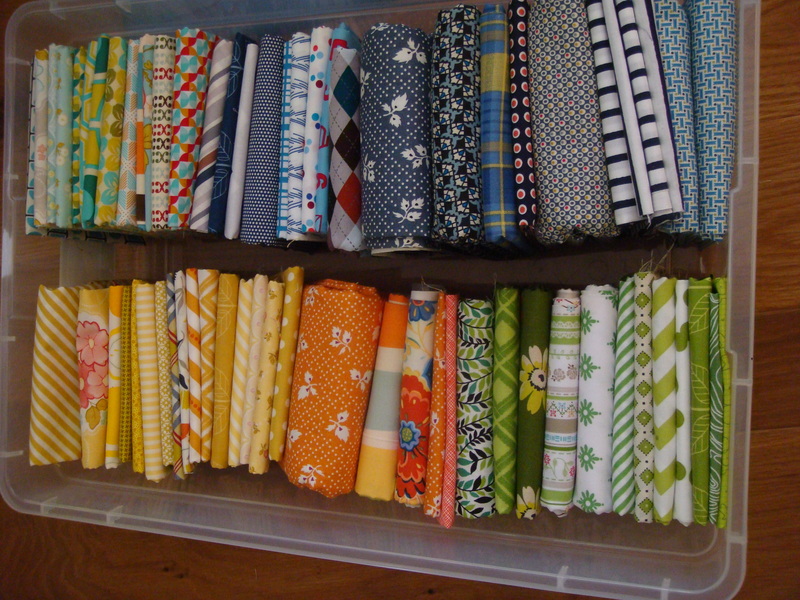 And later this week, a big announcement for our friends who are beginners or have not yet made their first quilt! 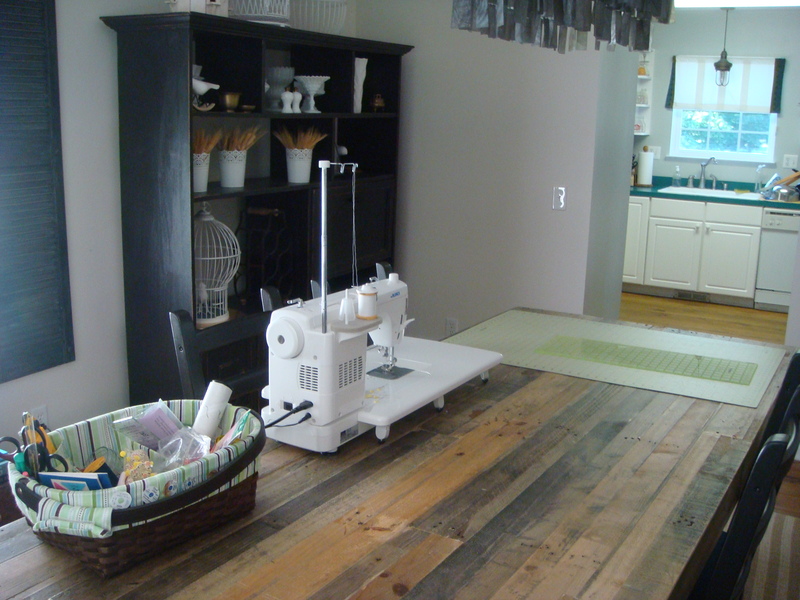 This entry was posted in Uncategorized and tagged folding fabric, Sewing room. Bookmark the permalink. First off……I love your dining room table! And thank you for posting the Jeni Baker links. I saw them last week too but forgot to check her out. Also, glad you like that Juki. I’m upgrading from my tiny Brother later this year and just added it to my list of machines to check out! if you are serious about selling your acuquilt cutter, i would be interested quite possibly ;o) i LOVE your space. i admire people like you. i seem to be soooo cluttered, even when things are supposedly tidy, they look messy. i love your space. Ummm… your dining room table… Gorgeous!!! Your space looks so calm and inviting. I can imagine many hours spent sewing here. Thanks so much for sharing! I think I have the Brother version of your Juki. I love it. I used it on my quilting frame. I also have a Bernina which I love. I admire how you keep your quilting contained. I overflow from two bedrooms devoted to quilting/crafts. I clicked on your studio because I saw your Juki! I also bought one earlier this year and absolutely love it. 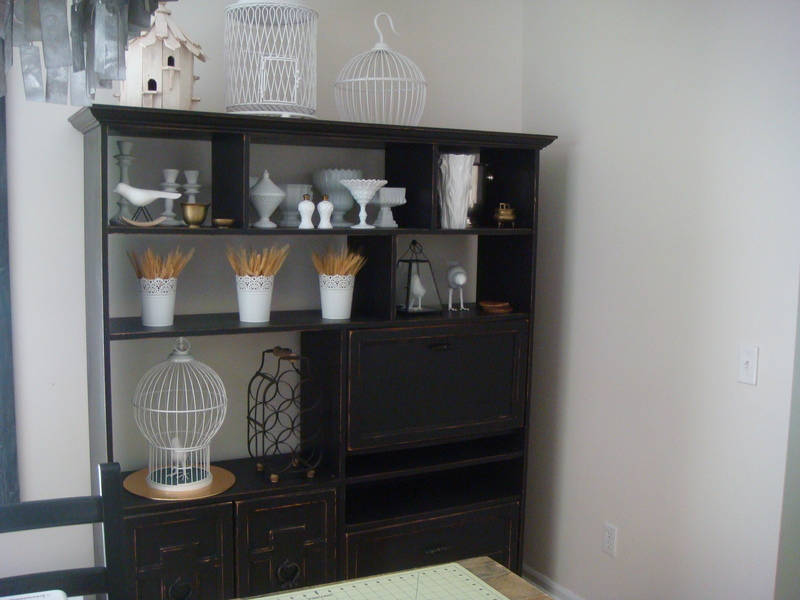 Hope you get your sewing room, but in the meantime, you’re doing a beautiful job with the dining room. This is a beautiful space. I love that table, and I’m impressed that it’s all so tidy! I have my fabric out on shelves, and while it’s nice to be able to look at it, my piles do get messy pretty regularly. Beautiful table under that fancy machine!